One of the foremost symbols within Freemasonry, the compasses combine with the Mason's Square. The letter G might be incorporated into the design, especially in older representations, and other elements might be added; a Sun and Moon for example. Although Freemasons prefer to leave many of their associated symbols open to interpretation we can make some assumptions about this particular emblem simply by looking at its form and by bearing in mind how the tools are used. Both the compass and the square are mathematical tools, used for precise measurements in disciplines that can leave no room for error: building construction, and architecture. 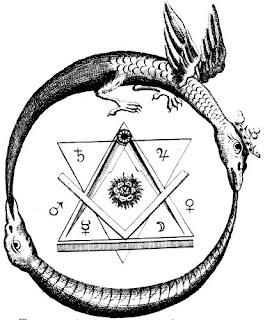 There is a natural symbolism between these tools, since the circle is used to form the square, and the square can be used to give form to the circle; this is called squaring the circle and is a fundamental rule applied to geometry, sacred or otherwise. Any instruments used for measuring must,ergo, be symbols of judgement and definition. Further, in the Masonic pairing, the feminine circle (which it s the sacred task of the compasses to create) forms a perfect union with the masculine square; therefore the spiritual combines with the material, Earth and Heaven. Another aspect of the compasses and the square delves even further into the symbolism of the circle and the square, with the former representing space and the latter, time. The mason as "architect" rules over all the aspects of dimensions. because they are used to draw a perfect circle, the compasses themselves have significance as a toll used by God as the "architect" of the universe. This idea is represented perfectly by William Blake painting "The Ancient of days Measuring Time" in which God stretches toward Earth, compasses in hand, with the golden disc of the Sun behind him. Compasses work by turning on a central axle or pivot. This means that they are also a symbol of the Axis Mundi, of the circular nature of time, and of the Ourroboros, the serpent which continually swallows its own tail.